The gift store that we perused was called "Bellwether". Sadly, the store doesn't have a web presence nor an email. 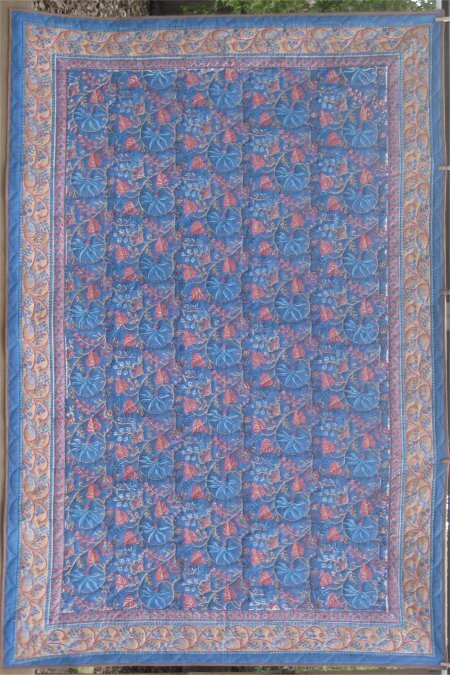 I had purchased a nice sized tablecloth, made in India, at the store, since I liked the colors and the design. It was one of those block-printed designs, not terribly accurate, but nice none-the-less. Because the printed design was so busy and intricate, I decided that I would attempt to follow the curvilinar design lines as the quilting path, in a matching color thread. 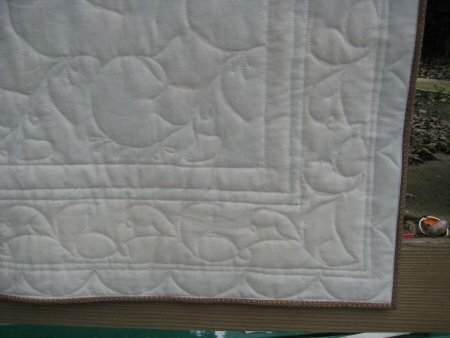 The result, if I was successful, would be that you wouldn't be able to see the quilting on the front at all. 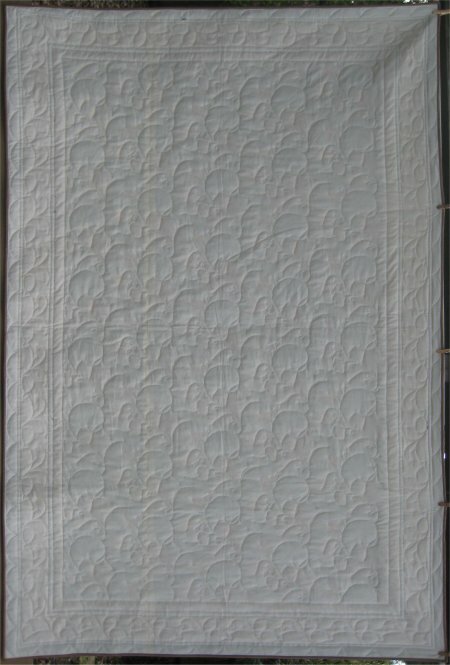 This would allow the printed design to be showcased and not obscured by any quilting motifs. 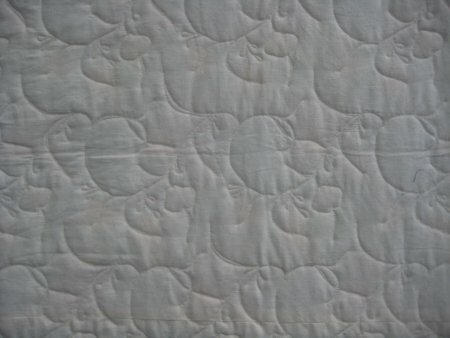 However, the actual quilting can be easily seen on the back. We now fast-forward to 2009 ... after Thanksgiving, after Christmas, after a commissioned client quilt in January and after quilting (only) another client quilt in early February, I started working on this quilt top. I finally put my new toy .. er, tool, the Line Tamer, to good use. Although I do have a straight edge ruler, I found it difficult to maintain a nice straight line with Lizzie using it. The Line Tamer works *fantastic*! As you can see from their website, it has a long slot channel that surrounds the hopping foot on 3 sides, making it exceedingly easy to control where the hopping foot is going. Sewing long straight (or mostly straight) lines without a channel lock capability was as easy as falling off a log. If there had been seams in this top, I would have been doing a LOT of stitch in the ditch! As it is, it merely LOOKS like I did it. I suspect that doing outline work around applique designs will be just as easy. The binding posed a small problem. 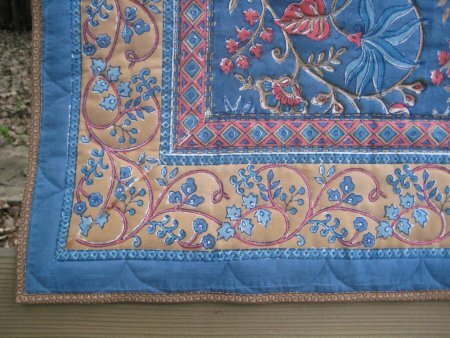 I had originally wanted a blue, close in color to the border so that the binding would blend into the quilt. While I had the perfect, absolutely PERFECT piece of yardage in my stash, it turned out to be not large enough ... it wouldn't yield as much binding as I needed to go around the quilt. Secondly, it was late at night; all the stores were closed, so dashing out that very minute was out of the question. 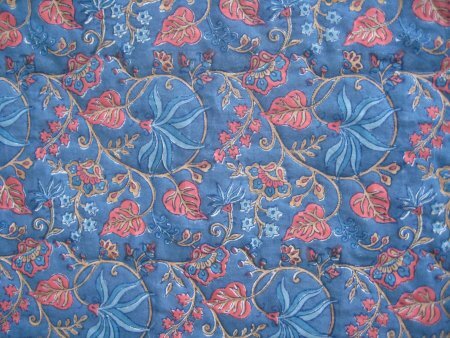 Besides, as difficult as this may seem to some, I really did NOT want to buy any more fabric. I wanted to use what I had in my stash. oh .. except for the label that is. I need to do the Bubble Jet Set thing on some muslin first.